Larry J. Sabato's Crystal Ball » IS THE SENATE THE REPUBLICANS’ TO LOSE? IS THE SENATE THE REPUBLICANS’ TO LOSE? 14 months out, a tentative "yes"
The recent decision by ex-Sen. Russ Feingold (D-WI) not to seek the seat of his retiring colleague, Democratic Sen. Herb Kohl, was a big moment for Republicans because it gave them yet another clean shot at a Democratic-held Senate seat. Feingold, still popular despite his reelection loss last year, would have been a favored quasi-incumbent had he run. Instead, his decision is just another piece of miserable news for Democrats in this cycle’s race for the Senate. Remember, there are 23 Democratic-held Senate seats up for grabs this year, versus only 10 Republican-held seats. Realistically, only two of those 10 Republicans seats will be competitive next year: Nevada, a purple state where appointed Republican Sen. Dean Heller faces a tough challenge from Democratic Rep. Shelley Berkley; and Massachusetts, a deep Blue state where Republican Sen. Scott Brown will try to hold on against an as-yet unknown Democratic challenger. Both Republicans are vulnerable, but favored. Meanwhile, Republicans have plenty of chances to gain the four seats they need to guarantee them control of the Senate next year. We break down their pickup chances in Chart 1. Put another way, of 23 Democratic-held seats, almost three-quarters of them (17 of 23, or 74%) are at least potentially competitive. So even if they lose the presidency, Republicans only need to win fewer than a quarter of these seats (four) to get to the magic number of 51 — enough to make Sen. Mitch McConnell (R-KY) majority leader provided they don’t lose any of their own seats. And remember: Republicans need to net only three seats if they win the presidency next year, because a Republican vice president would break a 50-50 tie in their favor. It is worth noting that except for some bad candidate decisions in 2010, the GOP would be sitting pretty with a near-certain Senate takeover on the horizon for 2012. Republicans very likely would have had a seat or two more, and perhaps an outright 50-50 split in the Senate right now, if they hadn’t nominated Tea Party candidates in Colorado, Delaware and Nevada last year. This is a warning to the GOP for 2012, although the base might not be in a mood to listen. Republican Senate primary winners, if too far to the right, could hurt the party across the map this year. For example, Wisconsin and New Mexico are places where moderates who could perform well in a general election — ex-Rep Heather Wilson (NM) and ex-Gov. Tommy Thompson (WI) — might get knocked off in a primary by less electable contenders. From the perspective of Labor Day 2011, the GOP has a strong chance to win the Senate next year. Indeed, given the volume of ripe pickup opportunities, it appears that the Senate is the Republicans’ to lose. But with some bad decisions by GOP primary voters, and a revival of Democratic fortunes in 2012 if the economy takes a significant upturn, they could still forfeit this opportunity. 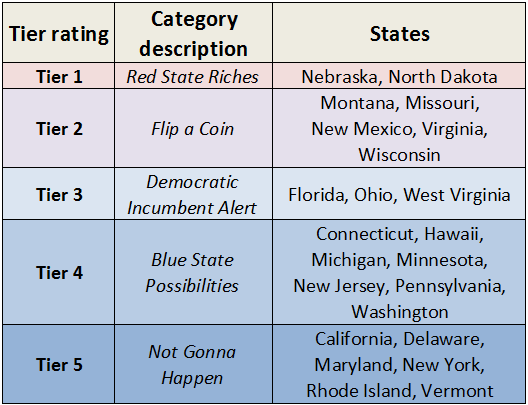 Full descriptions of each Senate race follow Chart 2, which has our listing of the races, candidates and ratings for 2012’s battle for the Senate. -Ex-U.S. Surgeon General Richard Carmona? – State Rep. William Tong – 2010 Sen. Nominee Linda McMahon? – Former U.S. Comptroller Gen. David Walker? – Consumer advocate Elizabeth Warren? – 2006 ME-2 nominee Scott D’Amboise – 2010 Gov. Candidate Rosa Scarcelli? – State Rep. Jon Hinck? – 2006 nominee/state Senate Min. Leader Tom Kean? – State Sen. Mike Doherty? (Running) – Businessman Keith Loiselle? – 2010 PA-12 nominee Tim Burns? (Running) – 2009 King Co. exec. candidate Susan Hutchison? – U.S. Rep. Ron Kind? – Ex-Rep Steve Kagen? – Ex-Gov. Tommy Thompson? (Running) – Rep. Shelley Moore Capito? NEBRASKA: Democratic Sen. Ben Nelson is the most endangered Senate incumbent in the nation, although he could benefit from what is expected to be a competitive and nasty Republican primary among frontrunning Attorney General Jon Bruning and top challengers, Treasurer Don Stenberg and state Sen. Deb Fischer. Bruning recently found himself in hot water for comparing welfare recipients to raccoons who feed on beetles. Nelson, for his part, is tacking to the right and talking about deficits and debt — and doing his best to distinguish himself from President Obama. One potential silver lining for Nelson: congressional redistricting did not substantially change Nebraska’s Second Congressional District, whose single electoral vote went to Obama in 2008. Obama’s campaign might make a play for that electoral vote again, which would provide some indirect organizational assistance to Nelson in what should be his friendliest portion of the state. A Nelson win might be an indication on election night that Republicans had fumbled away their chance to win the Senate. This race remains a TOSS-UP, although right now, that might be too generous of a rating for the incumbent. NEW MEXICO: Spirited primaries are likely on both sides of this battle to replace retiring Democratic Sen. Jeff Bingaman. The favorites are ex-Rep. Heather Wilson on the Republican side and current Rep. Martin Heinrich on the Democratic side, but they face challenges from, respectively, Lt. Gov. John Sanchez and Auditor Hector Balderas. (Businessman Greg Sowards might play a role in the GOP race as well). In the Democratic race, Heinrich received AFSCME’s endorsement several months ago, but five locals in New Mexico are backing Balderas, who some argue might be the Democrats’ answer to Hispanic Republican Gov. Susana Martinez. Meanwhile, Wilson has received fundraising support from mainstream Republicans like ex-Bush adviser Karl Rove and Sen. John McCain; on the other hand, conservative activists dislike Wilson, who lost a 2008 Senate primary to Rep. Steve Pearce, and are backing Sanchez. Democrats may ultimately be favored in the Blue-leaning Land of Enchantment, but this race is a TOSS-UP for now.